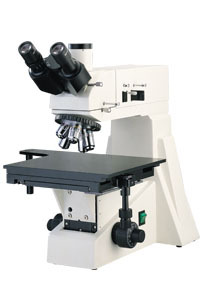 XJL-101 series reflected metallurgical microscopes are suitable to observe the microscopical surfaces of non-transparent object. They are equipped with large move range mechanical stages, reflected vertical illumination and set polarizer device in trinocular. They have clear and high-contrast picture beautiful sculpt, convenient control and etc. they are the ideal instrument in research work in metallography, mineralogy, precision engineering, electronics and etc. They are suitable for scientific research, teaching demonstration in the colleges and factory. With plan achromatic objectives with long working distance (no cover glass) and wide-field eyepieces, can get clear pictures and wide view field. With large move range mechanical stages, can move quickly and slowly. Coaxial coarse/fine focus system, with tensional adjustable and up stop, minimum division of fine focusing: 0.7μm. 6V 20W halogen lamp, adjustable brightness. Trinocular, can switch to observe normally or to observe the polarize, can send 100% of light to the binocular eyepieces or to the top port. Stage adjustable, Coaxial coarse/fine focus system, with tension adjustable and limit stopper, minimum division of fine focusing:0.7μm.